Chronicles of a Foodie: I'm a Baker Babe! I've officially been dubbed a Baker Babe! 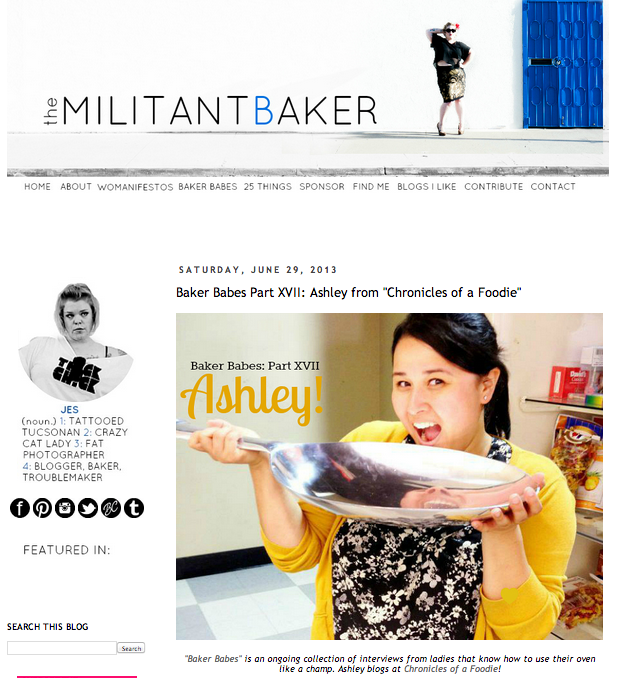 One of my absolute favorite blogs, The Militant Baker, has a segment celebrating "ladies that know how to use their ovens like a champ" aka, Baker Babes! I'm so honored to have been interviewed by Jes and to join the ranks of fellow lady bakers! The Militant Baker recently made headlines and was even featured on The Today Show for her open letter and photo shoot to Abercrombie and Fitch CEO. She's breaking down stereotypes, spitting mad truths and inspiring beauty of all sizes. I've been a fan of hers for a while and am so happy to be featured on her site! Check out my Baker Babe interview here!